Titus exhibited the characteristics of a risk-taking entrepreneur throughout his life. While still living at home in his teens, he befriended the pastor of the First German Presbyterian Church, the Reverend Wolters. Rev. Wolters told Titus about his close friend, Rev. Tom Rabenberg, who was assigned as a missionary in the Province of Saskatchewan, Canada. Rev. Rabenberg talked about the real estate boom happening in Canada and was advising his seminary friends about these investment opportunities. Titus eventually scraped together $600 in savings and invested this money with Rev. Rabenberg in Canadian land speculation. At the same time, Titus started college at Marquette University and was living in Milwaukee. What happened next is particularly amusing. 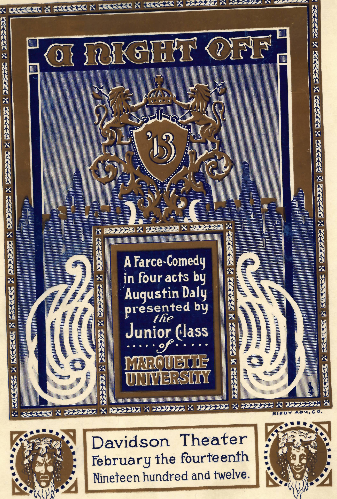 Titus was elected by the student body to be the Secretary and Treasurer of the Marquette Junior Prom, a position Titus considered quite an honor since faculty chose the other positions on the Prom Board. The Executive Board of the 1912 Prom. The year is 1912, prohibition talk is heating up across the country creating financial stress for brewers, so there is no way Titus can ask his father for the money he needs to properly fund the social events surrounding the prom, including the cost of getting his date to and from St. Paul, Minnesota where she lived. With little choice, Titus contacted Rev. Wolters and asked to sell his interest in the Canadian real estate. Titus was overjoyed to find that his $600 investment had grown to $1700. While this easily paid for the Prom festivities, it also helped Titus begin to think about other business opportunities. Titus reached out again to Rev. Wolters and proposed a business idea; Titus envisioned that he and Rev. Wolter form a company to raise capital for real estate investments in Canada. Rev. Wolters liked the idea and wrote Rev. Rabenberg, requesting he come to Dubuque to discuss this business proposition. Within a few months, in the summer of 1912, the Equitable Land and Investment Company was formed, with Rev. Rabenberg elected Treasurer, Rev. Wolters elected President, and Titus Schmid, at the age of 20, elected Secretary. However, this newly formed company was not yet ready for a full time employee, much less a Secretary, so Titus continued with his plan to transfer to Harvard Law School in the fall of 1912. Harvard seemed like the answer to Titus’ restlessness as he continued his studies in law school while pursuing any other business opportunities. When Titus received a telegram from Rev. Rabenberg the following Spring (March 1913), asking if Titus could move to Saskatoon immediately as he was badly needed, Titus made a quick decision to drop out of Harvard and move to Canada. Titus, as was customary in the day, made an appointment with the Dean of the Harvard Law School, to discuss his departure. The Dean was incredulous, and wired Titus’ parents immediately. Not to be deterred, Titus left that very evening for Montreal, bound for Saskatoon. 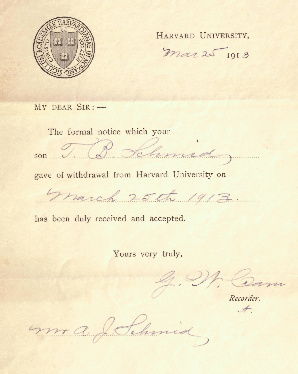 Formal Notice of withdrawal from Harvard University, signed by Mr. A.J. Schmid, father of Titus. 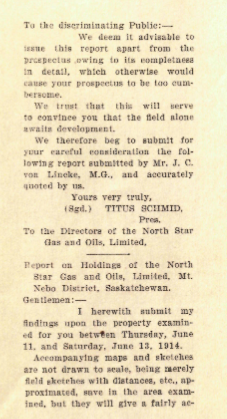 Prospectus for an investment with North Star Gas and Oil, offered by the Equitable Investment Co., LTD.
We deem it advisable to issue this report apart from the prospectus, owing to its completeness in detail, which otherwise would cause your prospectus to be too cumbersome. We trust that this will serve to convince you that the field alone awaits development. We therefore beg to submit for your careful consideration the following report submitted by Mr. J.C. von Lincke, M.G., and accurately quoted by us. Based on property examination: Between June 11-13th, 1914. I would like to say that Titus was successful in his Canadian real estate venture over the next few years but that was not the case. He was a managing partner in many real estate deals, but the vast majority of the deals failed. When war was declared between Germany and England in September 1914, all of the pending deals started to dry up. Titus had no choice but to cut his losses in Canada and find a way to get back to Dubuque. He had absolutely no money left and was beholden to his business friend, the manager of the Royal Bank of Canada in Saskatoon, who lent him $200 even when there was no obvious way for Titus to repay him. Later in his life, Titus spoke often of his appreciation for the confidence this banker had in him. This experience in Canada taught Titus a valuable lesson about building a strong network of business colleagues based on trust and mutual respect, which Titus carried with him the rest of his life. Titus made it back to Dubuque in 1915, borrowed the $200 from his father Alphonse (Titus borrowed this money reluctantly as Alphonse was financially strained due to prohibition) and sent his payment to Canada. However, all was not lost from his Canadian investment. Titus still owned stock in the Equitable Land Company. Although this Company did not have cash to buy back the shares, Titus worked out a deal with his partners to exchange his stock for a farm the Equitable Land Company owned in Windom County, Minnesota. He held onto that farm investment for a year, then traded it for a farm in Sand Springs, Iowa in late 1916. On December 25, 1916, Titus handed the title of this farm to his Dad, Alphonse, in payment for his debt of $200. 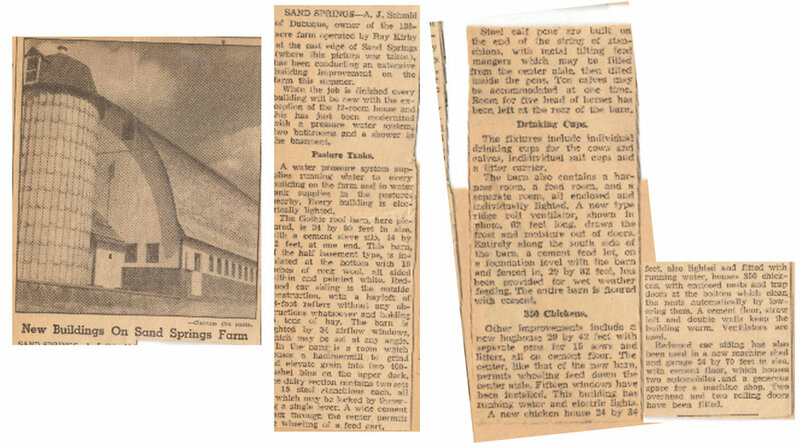 This farm stayed in the Schmid family until the 1950s and was one of the first farms in Iowa to modernize with electricity. This short video shows Alphonse in 1938 at his farm. Alphonse looking over the farm (1938). Dubuque Telegraph Herald Newspaper article, circa 1930s. *All Titus quotes throughout the vignettes, unless otherwise noted, are provided by Titus Schmid in a self-published book, 1919 to 1964: The History of Crescent Electric Supply Company,” written by Titus B. Schmid. By late winter, Titus considered moving to the western United States for a job in one of the newly formed banks there. As luck would have it, before Titus left, a local banker who was a friend of Titus, contacted Titus to let him know of a potential local investment. A local electrical contractor had requested a $1,000 loan from the bank but was turned down. The banker knew Titus had funds to invest, and knew the electrical contractor was “a good moral risk.” Titus called on this contractor with the idea of lending him the $1,000. Iowa enacted Prohibition on January 1, 1916, and National Prohibition went into effect January 1, 1918. While the breweries were forced to close, many of these breweries owned taverns, which could be remodeled for other uses. With the increasing acceptance of electricity in both commercial and residential property, there was a lot of business for the newly founded Schmid-Lowe Electric Company. The Union Electric Company, the local public utility, did its part to increase business for the Schmid-Lowe Electric Company along with other electrical contractors by hiring salespeople to call on both commercial and residential prospects, urging the installation of electricity rather than gas. There was tremendous demand and the Schmid-Lowe Company was one of only five electrical contractors in Dubuque to handle this increased business. Business was going so well that Titus felt “settled” enough to marry. 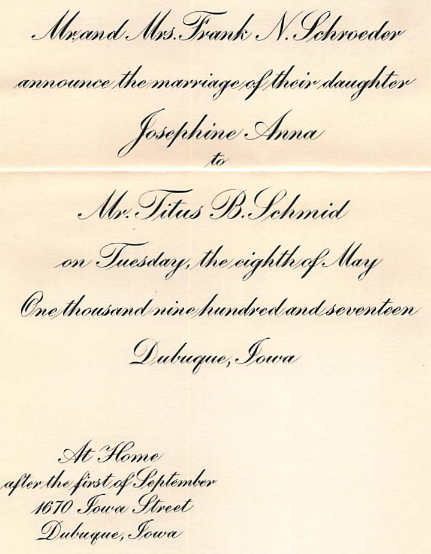 On May 8, 1917, Titus married Josephine Schroder, the youngest of eight children, and the daughter of the owner of a successful vegetable produce operation in Dubuque. So Titus, at the age of 24, was now married and the co-owner of a successful electrical contracting business. All seemed “settled” but.............................. our current family business may have remained an electrical contracting business if not for one very important event that happened to Titus in 1917. Titus received a large order from a very important customer who needed the materials the next day. Titus phoned the order into their electrical wholesale supplier in Chicago and was assured it would be sent that afternoon by express mail. The order did not come the next day and the customer was irate. It was at that moment, listening to a tirade of expletives from his customer, that Titus had the idea of selling electrical wiring and accessories at wholesale right in Dubuque. The reliance on wholesalers from Chicago, and the unreliability of delivery, paved the way for this new business idea. Titus spent the next year developing his idea and researching possible manufacturers. When World War I ended on November 11, 1918, Titus decided to act on his new business venture. He hired a sales manager (Tom Kelley, a salesman who worked for the supplier who missed the order), sold his interest in the Schmid-Lowe Company and in early 1919, began to send out letters to every manufacturer he knew announcing that an electrical supply house was to be established in Dubuque and he wanted to distribute their merchandise. A few months later on April 15, 1919 Titus opened for business as Crescent Electric Supply Company. A family business that is continuing into the fifth generation is the wonderful result of this history.